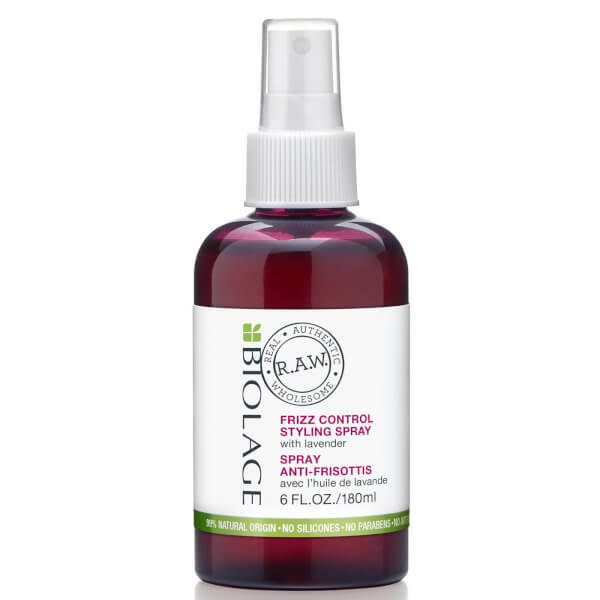 Fight frizz and flyaways with the Biolage R.A.W. Frizz Control Styling Spray; a Lavender infused formula that puts you in control. Misting effortlessly and evenly over damp locks before styling, the convenient spray ensures hair is smooth and sleek once blow-dried. 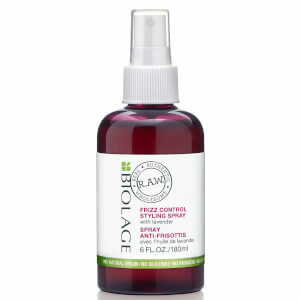 The styling formula can also be spritzed onto dry tresses for instant reshaping. Expect a smooth finish with an enviable sheen. Frizz will be a thing of the past. Shake before use. On damp hair, spray evenly. Comb through evenly and blow-dry. Use on dry hair for quick reshaping. Apply liberally and style as desired. Aqua / Water, Maltodextrin, Inulin, Polyglyceryl-10 Dioleate, Glycerin, Sodium Benzoate, Salicylic Acid, Camellia Sinensis Leaf Extract, Gossypium Herbaceum / Cotton Extract, Lavandula Angustifolia Oil / Lavender Oil, Linalool, Tocopherol.